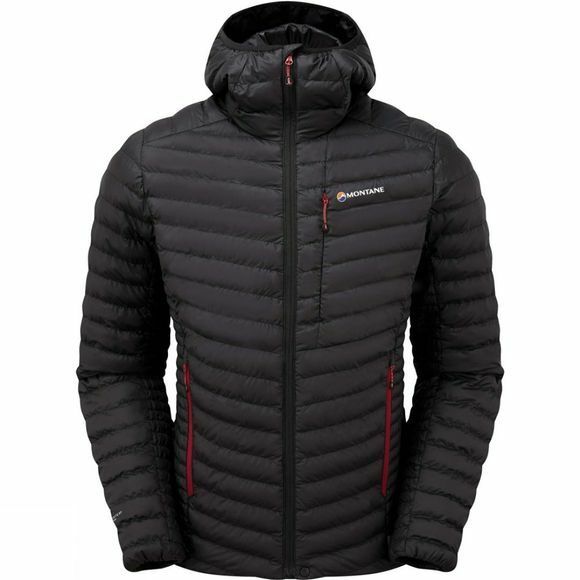 The Men's Icarus Insulated Jacket from Montane is a toasty insulated jacket that utilises Primaloft ThermoPlume insulation to keep you feeling warm in cold conditions. Thanks to advancing technology ThermoPlume insulation is incredibly lightweight and warm and still able to retain loft and thus insulation properties when it is faced with damp conditions. It is particularly close to mimicking the structure of down resulting in a small pack size that is perfect for taking out into the hills. The full length zip makes it easy to get on and off while the low profile hood sits comfortably underneath a helmet when required. There are two zipped hand pockets and a zipped chest pocket for stashing essentials and the elasticated cuffs, hem and hood help to keep the drafts and spindrift on the outside without the need for fiddly adjustments. A great insulation option for active, cold weather, outdoor explorers.